Gilbane Development Company’s Public | Private Development Group specializes in implementing innovative real estate solutions for public entities and institutions throughout the United States. 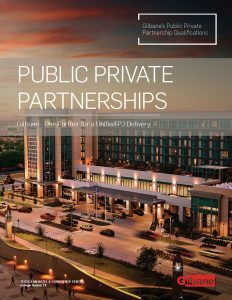 Our Public | Private Partnerships allow people in the public sector to realize new value from under-utilized assets. These partnerships can range from a basic land sale to a complex lease/leaseback transaction. They may also encompass the sale of excess public land or buildings with development covenants; developing a public build-to-suit facility on a ground lease with revenue-sharing provisions; or even exchanges and land swaps which incorporate mixed-use elements and integrate public and private uses. Our deep understanding of real estate development, finance (taxable and tax-exempt), and project management allows us to provide innovative solutions that minimize financial risk to the public, while offering value for all stakeholders, public and private alike.